Tag line: "Two countries, two loves, one heart"
Brooklyn, a 2015 movie directed by John Crowley, was nominated for Best Picture at this year’s Academy Awards. I’ll agree it’s a well-made film, and star Saoirse Ronan delivers an extraordinary performance, but in many ways it was a typical drama / romance, the kind you might see broadcast on the Hallmark channel. I liked Brooklyn, and would recommend it to others (I showed it to my wife, actually, and she thought it was terrific). But Best Picture of the year? No, I don’t think so. Eilis Lacey (Ronan) is leaving the small town of Enniscorthy, Ireland behind and is heading to America. Her sister Rose (Fiona Glascott) believes this is the best thing for Einis, and is convinced it will give her a shot at a better life, something she wouldn’t get if she stayed in Ireland. Following a rough trip at sea, Einis arrives in New York City, where her sponsor, Father Flood (Jim Broadbent), has already found her a good job (working in a department store) and a place to live, namely a Brooklyn boarding house run by Miss Keough (Julie Walters). At first, Eilis has a hard time adjusting to life across the pond, and misses her sister Rose as well as their mother. But with a little more help from Father Flood, Eilis slowly starts to fit in, and even begins dating Anthony (Emory Cohen), a plumber who, in a few short weeks, falls head-over-heels in love with her. It isn’t long before the two are making plans for the future, but when a tragedy forces Eilis to temporarily visit Ireland, she realizes that life there can be just as good as it is in New York, and wonders if returning to America (and Anthony) is, indeed, the right thing to do . Though I don’t believe it was worthy of a Best Picture nod, Brooklyn did receive one Academy Award nomination that it absolutely deserved: Best Actress in a Leading Role. 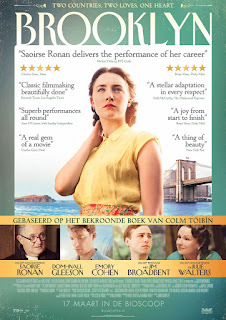 Saoirse Ronan, who seems to have grown up in front of the camera (she was 13 when 2007’s Atonement hit theaters, and despite her age, she was damn good in that movie), is near flawless as Eilis, the timid girl who travels far from home and starts anew in America. Frightened and lonely, Eilis doesn’t initially feel at home in New York, but before long her worries and inhibitions melt away. With each passing scene, we see Eilis’ confidence grow stronger, and when fate takes her back to Ireland for a short while, those closest to her recognize that she isn’t the same shy, demure person who left all those months ago. Through a friend, she meets Jim Farrell (Domhnall Gleeson), and as the two spend time together, Eilis strongly considers remaining in Ireland so she can be with him. Following its lead character’s growth from a nervous girl into a self-reliant young woman is Brooklyn’s strongest aspect, and the fact that Ronan is front and center for most of the movie is definitely a plus. 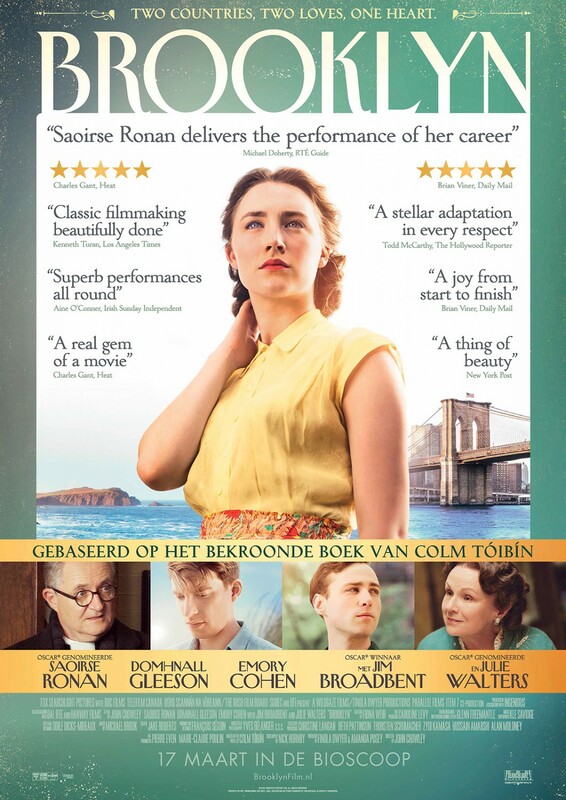 Some of the supporting cast is equally as good, including Jim Broadbent as the kindly priest who takes an interest in Eilis and Julie Walters as the gruff, yet usually funny landlady, Miss Keough, but it’s Ronan’s understated, poignant performance that gives Brooklyn its charm. I know I’m a Tarantino fanboy, yet I still believe The Hateful Eight was more deserving of a Best Picture nomination than Brooklyn (aside from being one of the most engaging films of the year, The Hateful Eight marked the return of the 70mm format, which Tarantino and his cinematographer Robert Richardson pulled off perfectly). Again, Brooklyn is a fine film, and in some ways an exceptional one, but a decade from now, when looking back on the movies of 2015, people will still be talking about The Hateful Eight. I’ll be surprised if they even remember Brooklyn.